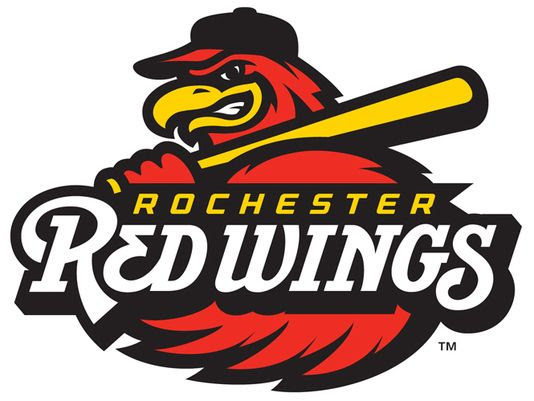 ROCHESTER -- The Rochester Red Wings dropped a 1-0 contest to the Columbus Clippers Sunday afternoon at Frontier Field. The Wings host the Gwinnett Stripers (Braves) in a 5:05 p.m. doubleheader Monday; it's another Kids Eat Free Monday, when the first 500 kids 12 and under get a free hot dog, drink and snack. Wings rookie right-hander Fernando Romero opposed Clippers veteran right-hander Alexi Ogando Sunday and both pitchers set down the side in order in the first inning. Through the first three innings, both pitchers had faced the minimum thanks to a pair of double plays. In the top of the fourth inning, the Clippers picked up the game's first hit and first run. Greg Allen led off with a double, and scored on an RBI single from Yandy Diaz. Ogando cruised into the fifth inning having not allowed a hit, then struck out the side to give him eight strikeouts on the day. In the top of the sixth, Romero matched the feat by striking out the side, and running his total to nine strikeouts on the day. James Ramsey broke up the no-hit bid by Ogando in the bottom of the sixth, drilling a 2-2 pitch to right field for a single. Willians Astudillo's sacrifice bunt moved Ramsey over to second base, and Ogando was lifted after a flyball out in favor of Jeff Beliveau. Nick Buss reached first after striking out, as Beliveau's wild pitch also allowed Ramsey to move up to third base. A walk to Leonardo Reginatto loaded the bases, but shortstop Yu Chang made a diving catch of a sinking hit from Jake Cave to snuff out the scoring threat. Ogando worked 5.2 innings and allowed just a hit and a walk with nine strikeouts. Ogando threw 70 pitches, 48 for strikes. In the top of the seventh, a pair of walks had two runners aboard with two outs. Matt Magill relieved Romero, and struck out Richie Shaffer to escape the jam. The Wings put two runners on with one out in the seventh against Beliveau, but a double play kept the score at 1-0 Clippers. In the top of the eighth, the Clippers put runners at the corners with two out but Magill's fourth strikeout ended the threat. Another scoring chance came for the Wings in their half of the eighth, with runners at the corners and two out. But Cave struck out against Jordan Milbreth and the game went to the ninth inning. Ryne Harper pitched the ninth for the Wings, striking out the side. That brought the Wings staff's strikeout total for the game up to 17. In the ninth, the Wings put runners on first and second with one out, and Jack Leathersich came out of the Columbus bullpen Leathersich struck out Ramsey, then was relieved by Ben Taylor. Astudillo popped out to end the game. The Red Wings out-hit the Clippers 6-3. NOTES: OF Nick Buss has now reached base safely in all 11 of his games...RHP Tyler Duffey has been named the Twins Minor League Pitcher of the Week for the period ending April 21. Duffey picked up the win in both of his appearances, striking out 10 in 6.2 scoreless innings pitched... LHP Casey Crosby was reinstated from the disabled list (left hanstring strain)...LHP Gabriel Moyawas optioned from the Twins to Rochester after Saturday night's game.